Nature villa with pool, Naturschutzg., Modern, secluded location with breathtaking views. Sea View. 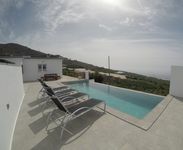 Property 22: Nature villa with pool, Naturschutzg., Modern, secluded location with breathtaking views. Sea View. I stayed a month and liked the house and location. Internet was good. Modern, light house. A little stark with no rugs on floors, no pictures on walls, no curtains (there are blinds). Area was quiet. Excellent weekly cleaning with generous supply of wine, coffee, eggs, fruit, etc. Kitchen would benefit from a microwave.